Who could resist being responsible for this smile? 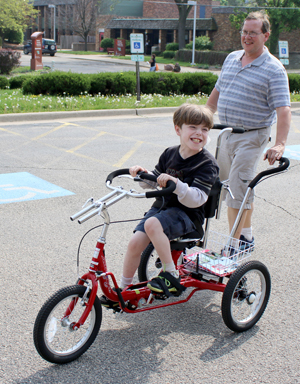 Today, over 56 million people in the United States self-identify as having disability. That’s nearly 1 in 5 of us. One of the leading causes for those disturbing statistics is limited access to a means of exercise. 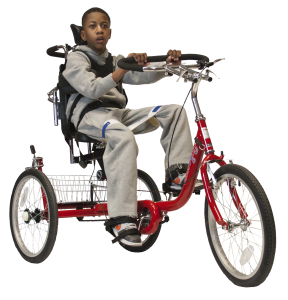 Recipients, parents and therapists report that the Amtryke adaptive tricycle provides increased strength, mobility and coordination as well as self-confidence and positive peer interaction. That all adds up to great exercise, the opportunity to be outdoors and just plain fun. Our passion is to create a world where everyone who chooses, can ride! The Amtryke Program gives chapter members boundless opportunities to serve and to personally witness lives tangibly changed by chapter fundraising efforts. If that’s a passion you can get behind, join a chapter, build a chapter or encourage your chapter to participate. Social entrepreneurship: the new wave every nonprofit is chasing. Luckily we caught it 20 years ago. On the for-profit side, that phrase generally translates into charging more for a product to fund a social impact project. Think of TOMS shoes where the buyer chooses to pay high prices for their shoes because TOMS then donates a pair to someone who can’t afford them. The wearer receives charitable props from everyone who notices their shoes. On the nonprofit side “social entrepreneurship” is often code for monetizing. Before you judge too harshly, consider: As government assistance wanes, many nonprofits are scrambling to even keep their doors open. They often have no internal funding sources available other than the unpalatable choice of charging the people who receive their services. Amtryke ensures that AMBUCS will never have to make that choice. We have a on-going, socially responsible funding stream that allows us to give away about 3,000 Amtrykes each year to people who could not otherwise afford them. In this way every member, every customer, every donor, every partner organization becomes a financial stakeholder in our mission to Inspire Mobility & Independence.